The Curious Studio: Register now for Save Philippine Seas and R4C's Dash for the Seas! Burn nothing but calories! Register now for Save Philippine Seas and R4C's Dash for the Seas! Burn nothing but calories! 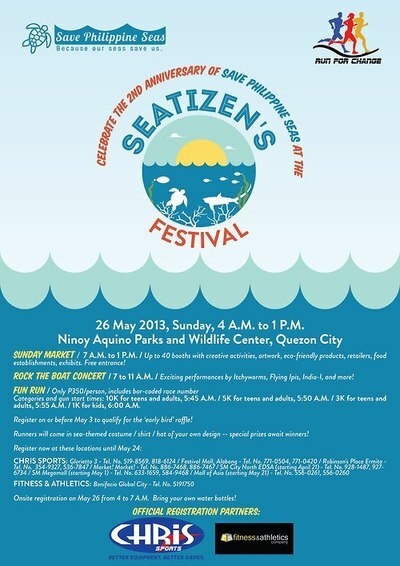 Register now for the Seatizen’s Festival’s Dash for the Seas in selected Chris Sports branches and Fitness & Athletics. You can come in a sea-inspired costume. Prizes await the most creative ones! No plastic and paper cups will be provided at the water stations. Participants and organizers alike must bring their own water bottles. Meals of the marshals and other volunteers will not be in Styrofoam or plastic. All materials for the directional signs are tarps that have been re-used every R4C’s races since 2008, replacing only those that are not usable. All publicity materials printed on tarpaulin will be donated to the Children’s Environmental Education Awareness Foundation, a non-profit that upcycles tarps into schoolbags. To download the registration form, please click here! Oh and don't forget to print on recycled paper! :) Yaaay see you there!